Below are common attributes associated to Mediterranian Fan Palm. Become a care taker for Mediterranian Fan Palm! Below are member comments regarding how to plant Mediterranian Fan Palm. No comments have been posted regarding how to plant Mediterranian Fan Palm. Be the first! Do you know how to plant Mediterranian Fan Palm? Below are member comments regarding how to prune Mediterranian Fan Palm. No comments have been posted regarding how to prune Mediterranian Fan Palm. Be the first! Do you know how to prune Mediterranian Fan Palm? Below are member comments regarding how to fertilize Mediterranian Fan Palm. No comments have been posted regarding how to fertilize Mediterranian Fan Palm. Be the first! Do you know how to fertlize and water Mediterranian Fan Palm? Below are member comments regarding how to deal with Mediterranian Fan Palm's pests and problems. No comments have been posted regarding how to deal with Mediterranian Fan Palm's pests and problems. Be the first! Do you know how to deal with pests and problems with Mediterranian Fan Palm? 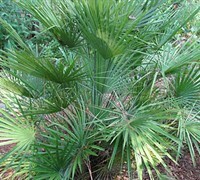 Looking for Mediterranian Fan Palm? Get European Fan Palm fresh and large directly from the grower to your garden! Buy European Fan Palm online from the nursery wholesalers and save BIG! European Fan Palm is hardy palm thriving in USDA Plant Hardiness Zones 8a to 11, meaning it is hardy to about 10 degrees F. It prefers growing in sites that provide well-drained, sandy soil and full sun to some light shade. Since European is a mid-size shrub palm that grows from about 6 to 12 feet or more in height, it is a good selection for use around swimming pools or other bodies of water, to accentuate entryways, or as a focal point specimen. To plant a palm, use your round point gardening shovel to dig a hole about 30 percent wider than the root ball in sandier soils and 50% or more wider in denser soils. If your soil is not lose but is very compact or dense, mix in some sandy bagged top soil, and/or straight sand, with the soil excavated from the planting hole. Avoid using peat moss as a soil amendment as these might retain too much water. Palms prefer well-drained soil. After you have placed your palm in the hole and positioned it, backfill the hole with the soil mixture tamping lightly as you go to remove air pockets. If the soil is very sandy and loose, you can build a soil berm about 3 inches in height around the perimeter of the planting hole to catch additional water from rainfall or irrigation. Apply about 3 inches of shredded wood mulch around the palm tree, making sure to keep mulch a few inches away from the trunk of the palm. If your palm is a tall one with a long trunk, you'll need to brace your newly planted tree. The tree brace consists of three wooden blocks with two adjustable straps that are designed to protect your new tree from storm and wind damage. You must acquire this brace when you purchase your palm tree at the nursery. The braces must be placed around the bark. In the absence of rainfall or irrigation, water your palm tree every day during the first two weeks after you've planted it. Then, beyond the two week point, use a hose to "slow soak" the area around the tree to prevent it from drying out. During dry spells, this slow-soaking procedure should be done twice a month during the warm weather season and once every 6 months during the colder season. Once established, your palm tree will rarely need watered provided there is average rainfall. Provide water during prolonged drought. Pruning Palms is not absolutely necessary. Somehow, before humans and their pruners and saws arrived, palms lived for millions of years on the planet. Good palm tree care can mean AVOIDING removing most of the leaves (fronds) yearly or more frequently because it may weaken the palm and slows its growth. Mature fronds provide food for developing fronds, flowers, fruit, roots and storage reserves in the palm's trunk. When healthy green fronds are pruned, the nutrients they would have produced are lost to the rest of the tree. Some nutrients move from older leaves of palms to newer leaves as they die. Removal of older green or chlorotic leaves exacerbates nutrient deficiency. Nutrient deficiencies retards growth. When pruning, take care to leave at least two rows of mature fronds (those that have turned greenish-yellow or muted green), preferably more. Never prune off more of the palm's leaves in one year than are produced during that time. Simply put, do not remove a palm tree frond until it has completely died (turned totally to brown). I've seen no serious insect, pest or disease problems with European Fan Palm. Consistently wet soil can cause problems and damage or kill your palm. Plant in well-drained sandy soil and amend dense or compacted soils with sand or sandy top soil. Temperatures below 10 degrees F can damage or kill the tree. Regarding fertilization, palm trees require specially formulated Palm Tree Fertilizers that answer to very specific conditions. If palms grow in your region, your local nursery and garden center should stock palm tree fertilizer. If not, ask them to order it for you. Follow instructions on product label for application rates. The most important factor for a healthy palm tree is good soil. The type of soil determines how much nutrients and water the plant receives. The best contribution you can make to your palm tree's soil is the addition of beneficial mycorrhizal fungi. These fungi exist naturally in most soils that haven't been disturbed by tilling and haven't been treated with chemicals and chemical fertilizers. The word "mycorrhiza" comes from the Greek language and literally means "fungus roots". You may not know it, but mycorrhizal fungi are a crucial part of the health of 95% of the plants growing throughout the world. Organic compost is a good source of fungi. When planting a palm, be sure to add a small amount (a few double handfuls) to the backfill mixture.